The priest’s hand rested on the small, carved handle that controlled the pitch of the window’s nyawood shutters. A slight turn of the wrist would be all it required to close them firmly against the lessening day outside, but he hesitated, peering through the slits at the city streets ranged below. The smell of smoke was more pronounced now, and the faint acridity made his nostrils twitch. The scent was already in the room with him, different from the wisps that issued up from the cairn of glowing stones in the chamber’s fire pit. Outside, the fires that raged were uncontrolled and full of lethality; in here, deep within the fusionstone halls of the Naghai Keep, he was safe. The thought drew up the corners of his lips in a brief, bitter smile, his blandly handsome face turning away. Safe. The term was such a relative concept, a fragile construct stitched together by fearful men and women who marked out pieces of their world and declared them inviolate, as if they could wall off danger and forbid it to trespass. Gar Osen, vedek of the Prophets, could declare himself safe inside these walls, but he knew that the granite battlements and copper-studded gates were no more than paper to an aggressor who was determined to breach them. To think of oneself as safe from anything was foolish; a person could only truly exist in degrees of jeopardy, spending their life balancing the chances of death against moments of comparative peace. The bitter smile turned grim and stony. Beneath the windows of the keep, far out past the ring wall and the ornamental public gardens beyond, into the city of Korto itself, Gar’s gaze ranged over the shaded boulevards of the municipality. The fading day was prematurely dark with oily gray rain clouds rolling in from across the Sahving Valley, as if the weather itself were attempting to draw a veil over what was happening down on Korto’s thoroughfares; but he had no doubts that the same sequence of events was taking place all over Bajor, in the cities of Ilvia, Jalanda, and Ashalla, across the spans of the planet from Musilla to Hedrikspool and every province in between. He imagined he would see the same thing, hear the same sounds if he could stand at similar vantage points in those places. A woman’s scream, sharp as the bark of a tyrfox; the long rumble of a building collapsing; air molecules shrieking as disruptors split them asunder; and the regular pulsing drum of gravity-resist motors. Gar saw a trio of shapes nosing slowly over the Edar Bridge, shield-shaped things that looked like legless beetles, shoving stalled skimmers out of their way with arcing force bumpers. Each had a spindly cannon on a pintle mount that tracked back and forth, tireless and robotic. For a moment, he wished for a monocular so that he might be able to get a better look at the armored vehicles, but there was little need. The priest knew exactly what they were. If he looked hard enough, he could just about make out the insignia painted on the sloping, gunmetal-colored hulls: a scythe-edged fan, something like a spread flower. The sigil, just like the grav-tanks and the beings that crewed them, was unlike anything native to Bajor. And yet they moved, not with the wary pace of new invaders, but with the arrogant and stately menace of an occupying army. Gar had only to watch them, and now the lines of figures in black battle armor coming up behind the tanks, to know that the Bajorans had already lost. The arrival had come, silent and steady as the sunrise, and Bajor had been looking the other way. The more Gar looked, the more he saw. Black-suited shapes here and there, in the marketplace and the City Oval. The blink of beam fire, followed seconds later by the noise of it reaching him high in the keep. He wondered idly where the citadel’s defenders had gone. Were they still up above him on the ramparts, peering through their rifle scopes at the same sights, too afraid to do anything, too surprised to discover they were no longer safe? Or perhaps they had run, fled to the hills or back to their families in the low-caste quarters of the city. The priest doubted that anyone had been able to escape. Nothing but smoke was in the air now, and he hadn’t seen anything lift off from the riverside port since the morning—and even that craft had been so small and so fast, it was impossible to know its design and origin. He thought he heard a clattering from the gates, but Gar’s chamber was on the far side of the keep from the main portcullis and the wind rose and fell, bringing only snatches of sound to his ears. Not for the first time that day, his thoughts drifted to the desk in the middle of the room where his effects lay in untidy profusion. Beside an open copy of Yalar’s New Insights was a cloth bundle concealing a narrow-bore phaser pistol. There was plenty of room inside the vedek’s voluminous robes to conceal the gun, but then what would that benefit him? To be an armed priest on today of all days—it invited trouble. And besides, he was quite capable of killing with his bare hands, if the matter pressed him to it. He looked down at his spread palms, at the thin and lightly tanned skin, the lengthy artisan’s fingers. There was a moment of disconnection, as if the hands belonged to someone else. Gar heard sounds out in the corridor beyond and the thread of his reverie snapped. Swift, frightened footfalls stumbled along the wooden floors, getting closer by the second. The vedek stepped to the table and laid a hand on the phaser, those long fingers slipping into the cloth to wrap around the weapon’s knurled grip. Gar knew the voice, and he schooled his face in the moment before he released the latch. Bennek hesitated at those words, as if he sensed something of an admonition in them. He worked visibly to calm himself and placed the bag upon the table, taking an empty seat. Gar offered him a flask of water, and the Cardassian drank greedily. “The others?” The vedek eyed the bag, wondering about its contents. “Gone,” Bennek said in a dead voice. “Scattered, murdered…I pray to Oralius that it is not so, but I have only seen bodies.” He grabbed at Gar’s wrist in sudden panic. “Can you hide me?” The words were plaintive, like a child’s. This Bennek was a far cry from the one who had first arrived on Bajor so many years earlier, full of purpose and brimming with unshakable belief. All that had been slowly beaten from him, flensed away over time until he was little more than the pale echo sitting before Gar. 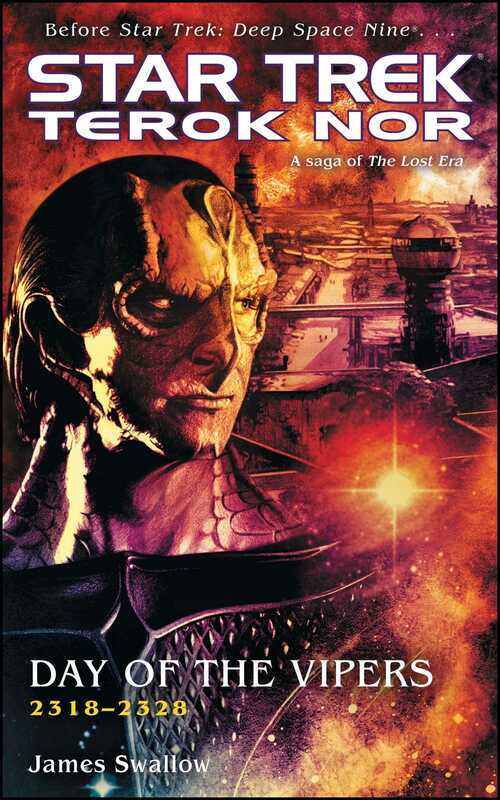 These past days, the events unfolding across Bajor, Osen saw now how they were the last turns of the screw, the final pressures that broke the Cardassian priest’s will. “Please?” Bennek asked. Bennek nodded. “But now I have to be.” He opened the bag and removed an object hastily wrapped in a torn and scorched strip of prayer tapestry. Gar recognized the tightly lined forms of Hebitian script across the blackened cloth. Bennek unrolled the tapestry and revealed an ornate mask carved from milky gray wood. The features of it were unquestionably Cardassian, but strangely fluid as well, and bore odd striations that some observers might think mimicked the nasal ridges of a native Bajoran. Something about the mask unsettled the vedek, but he was careful not to let that emotion show on his face. “It’s only a small impairment.” Gar appraised the mask. “It is one of the original Faces of the Fates, from the time of the First Hebitians on Cardassia,” said the other priest. “I’ve kept it safe for years…” He blinked, shaking away a moment of distraction. Placing the mask on the table, Bennek delved into the bag again and brought out a nested set of tubes made from murky glass. More etchings in the careful Hebitian script covered the exterior. “The Recitations,” explained the Cardassian. “This is one of only a few complete copies of the Word of my faith. This, my Bajoran brother, is the holy text of the Oralian Way in its entirety.” Bennek’s hands were shaking as he touched it. Gar was no stranger to the religion, having seen Bennek and the members of his congregation perform their rites on many occasions. They would don the masks, ceremonially assuming the role as the avatar of their god, before speaking the lessons of Oralius as read from their sacred scrolls. The vedek assumed that somewhere there had to be definitive originals of the text, but he had never dared to imagine that one of them might be here, on Bajor. Bennek’s breathless awe in the face of these two objects was ample illustration of the incalculable value the Oralians placed on them. “Why do you show me these things?” he asked. There were more footsteps out in the corridor: the heavy thud of armored boots matched with the splintering of doors being kicked open. Gar heard gruff voices shouting and calling out commands to one another.